This Jim Morrison t-shirt design is a tribute to one of the greats – the poster child for rock. Jim Morrison will always be known as one of the greatest rock singer, songwriter, and poet in the 1960s and it all started when he crafted the band name The Doors. This concept of “doors” between the known and unknown is a great example of Jim’s poetic mind. Just image what other amazing material this dark hero of rock could have provided if he didn’t die so young. It’s hard to believe he was only 27 years old when he left us. The way Jim Morrison captured a generation was so fascinating. One of the best memories of his rock rebel career would have to be on the Ed Sullivan Show when Jim was asked to change some lyrics, but of course he didn’t. Displayed on this Jim Morrison t-shirt design is one of his many iconic photo poses where we’ve symbolized his death. The design comes in both men and women t-shirt styles and even on smartphone and tablet cases, bags, throw pillow, hoodies and more – 26 total products available! We enjoy hearing from our fans! 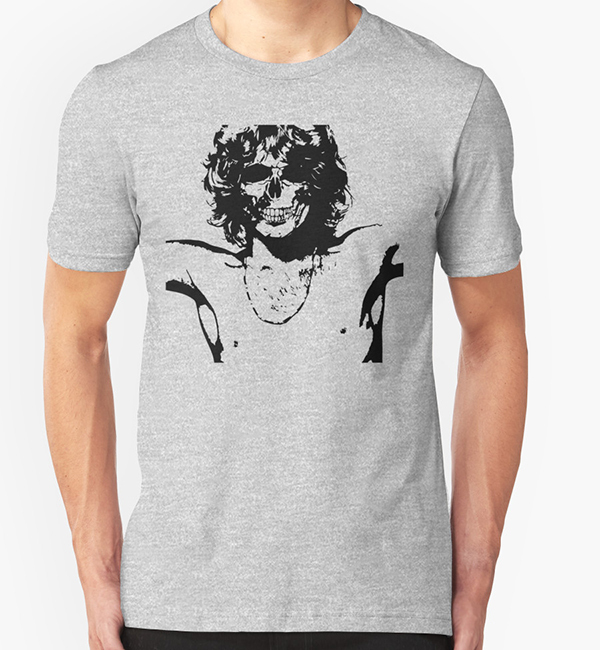 If you are inspired by Jim Morrison and this Jim Morrison t-shirt design or if you have suggestions of other musician t-shirt designs please leave your comments below.